Suspected Gunmen Arrested After 3 Canadian Mounties Are Killed : The Two-Way Authorities in New Brunswick, Canada, have arrested a man suspected in the shooting deaths of three Royal Canadian Mounted Police on Wednesday. Police officers take cover behind their vehicles in Moncton, New Brunswick, on Wednesday. Three police officers were shot dead and two others were injured in a shooting Wednesday night; Canadian police are searching for the suspected gunman. Authorities in New Brunswick, Canada, have arrested a man suspected in the shooting deaths of three Royal Canadian Mounted Police on Wednesday. Two other Mounties were wounded. A spokesman for the RCMP says 24-year-old Justin Bourque was arrested early Friday. A motive for the shooting is unknown. Police are searching for an armed suspect after a rare fatal attack on Canadian police. 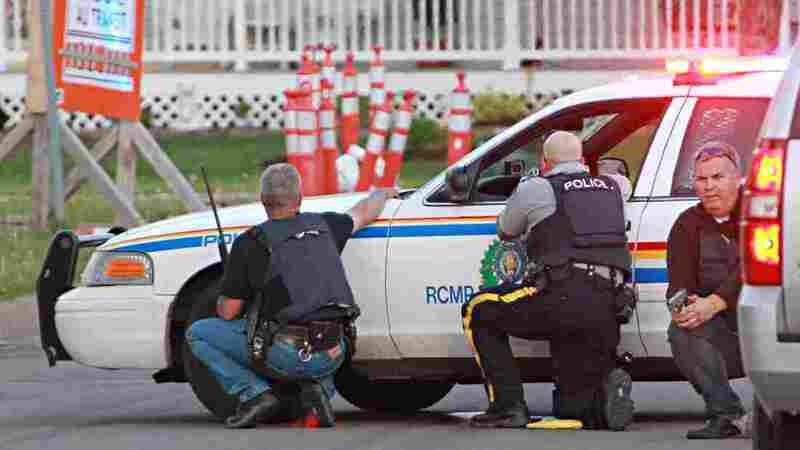 On Wednesday night, five Royal Canadian Mounted Police officers were shot in the city of Moncton, New Brunswick. Three died, and two are hospitalized in stable condition. The officers were shot after they responded to a call about a gun-wielding man wearing camouflage, reports Canada's CBC News. Police later tweeted a picture of the suspect, whom they identified as 24-year-old Justin Bourque. Transit services, schools and government offices have been shut down in Moncton, the CBC says, as officers search for the alleged gunman. Police believe the suspect is most likely in the city's Pinehurst subdivision, and they've asked residents in that area to remain indoors. This kind of violence is rare across Canada, and particularly unusual in this eastern part of the country, The Associated Press reports. The city of Moncton, which is home to almost 70,000 people, had no homicides last year — and, until Wednesday, none this year, either. One of the first witnesses on the scene, a photographer named Daniel St. Louis, told the AP that he saw bloodied police vehicles surrounded by shattered glass. As he walked closer, he saw the body of a police officer. "Our quiet little city, what is going on here?" he told the wire service. "How is this happening to us? It always happens to somebody else." Bill Daigle, a local resident who lives near the location of the shooting, told CBC News that when he and his wife first heard the sound of shots, they mistook them for fireworks. "It quickly became apparent that it was gunfight that we were hearing," he said. "It sounded like it was happening in our backyard." "This sort of thing just doesn't happen in this part of the world," Daigle said. The killings were a reminder of a 2005 shooting, reports the AP, in which four Mounties were killed in Alberta. That was the deadliest attack suffered by Canadian police officers in over a century. Police from across eastern Canada have joined the Moncton police in the current manhunt. CBC News is live-blogging the search for the suspected gunman.